[prMac.com] Carrickfergus, United Kingdom - =False Victories is pleased to announce its new app, Cartographer in the Mac App Store. It has been designed to work with Apple's MapKit framework on both OS X and iOS allowing users to add pin annotations, shapes and lines on top of a map view. Annotations and shapes can be coloured and titled with appropriate details. Once a map has been annotated, the details can be stored as a custom file format, or in the standard GeoJSON format. This exported file can then be used in a developer's own MapKit application saving the time of having to enter all the data manually. 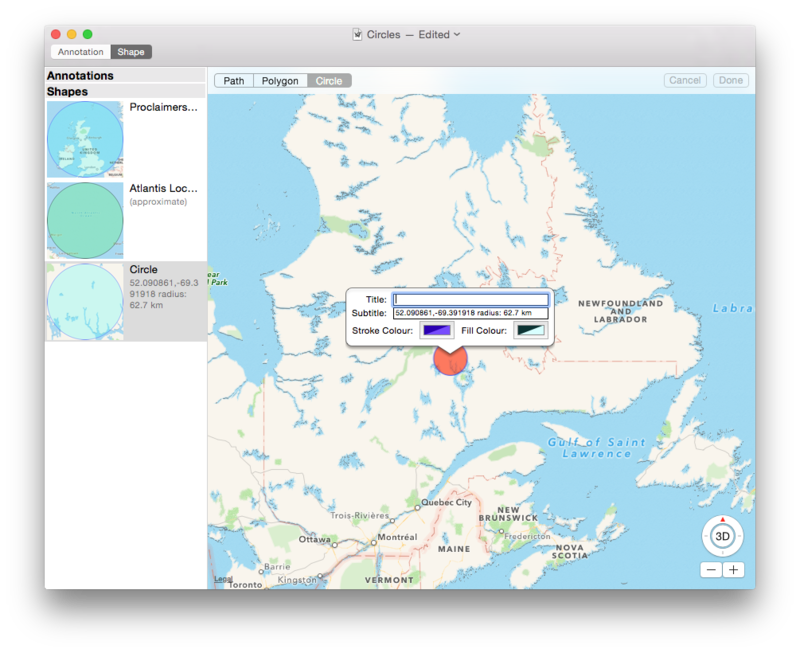 The Cartographer file format supports all the features of Cartographer and developers can use the freely available CocoaPod - CartographerKit - to integrate it into their own applications. Cartographer has a range of potential applications and was initially written to aid in the development of an iOS application for a music festival. This allowed numerous different locations within the festival including points of interest to be added and edited quickly, decreasing the App development time considerably and allowing last minute changes. Cartographer 1.0 is $13.99 USD (or equivalent amount in other currencies) and available worldwide through the Mac App Store in the Developer Tools category. It is also is available for free from CocoaPods or GitHub. False Victories was started in 2013 by Iain Holmes, a developer with over 15 years experience developing software on Linux and Apple systems. Cartographer is their third application having previously released TunesBar+ and an app for the Stendhal Festival of Art. All Material and Software (C) Copyright 2014 False Victories. All Rights Reserved. Apple, the Apple logo, Macintosh and Mac OS X are registered trademarks of Apple Inc. in the U.S. and/or other countries. Other trademarks and registered trademarks may be the property of their respective owners. "As an iOS app developing team located in China, we would like to express our sincere gratitude to prMac for their helpful and considerate services. Their free news distribution service gave us a tremendous boost to introduce our titles to the western world. Also, their staff kept in contact with us and helped us to correct some wrong grammatical and wording mistakes in the process. Thank you so much, prMac!"